Doyle Redmond, 35-year-old nowhere writer, has crossed the line between imagination and real live trouble. On the lam in his soon-to-be ex-wife's Volvo, he's running a family errand back in his boyhood home of West Table, Missouri - the heart of the red-dirt Ozarks. The law wants his big brother, Smoke, on a felony warrant, and Doyle's supposed to talk him into giving up. But Smoke is making other plans: he is about to harvest a profitable patch of homegrown marijuana. I love the characters he creates. What made the experience of listening to Give Us a Kiss the most enjoyable? I've loved Woodrell's books since they first came out in print and have enjoyed the audiobook versions even more to my surprise. For me they are the rare audiobooks that I have listened to more than once. I can't choose just one. I like them so much because they each remind me of characters, good and bad, that I know or know of from my home county in the Ozarks. He did a good enough job that I stopped noticing anything in particular about his voice and was absorbed in the story. I would hear the characters' voices as he read and not his. To me that's perfect. If you could rename Give Us a Kiss, what would you call it? I can't imagine anyone who gives Daniel Woodrell's books a listen being disappointed and I recommend them to everyone I can. 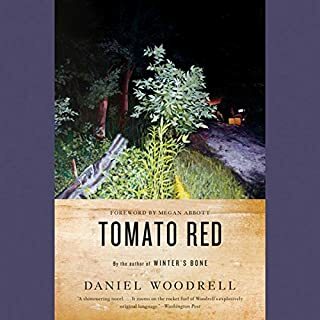 Where does Tomato Red rank among all the audiobooks you’ve listened to so far? top ten for sure and maybe top five. The familiar language of the area where I live as well as the characters and geography. The first time I read Tomato Red I was delighted to see the words and phrases that I've heard and spoken my whole life for the first time in print. Having read hundreds of books throughout my life Daniel Woodrell is the first author I've read to speak the language of my people and I love it. He did a very good job overall. Having a person from Southeast Missouri read the book would be the only way it could have been better maybe. I'm available for any future books based in SE MO if anyone is reading this. Who was the most memorable character of Tomato Red and why? For me it's Sammy, his familiarity to myself and others I know, sadly. I can't get enough of Woodrell's books when he writes about the Ozarks in particular. 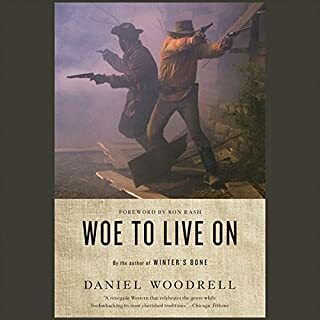 Set in the border states of Kansas and Missouri, Woe to Live On explores the nature of lawlessness and violence, friendship and loyalty, through the eyes of young recruit Jake Roedel. Where he and his fellow First Kansas Irregulars go, no one is safe, no one can be neutral. Roedel grows up fast, experiencing a brutal parody of war without standards or mercy. But as friends fall and families flee, he questions his loyalties and becomes an outsider even to those who have become outlaws. If you could sum up Woe to Live On in three words, what would they be? What other book might you compare Woe to Live On to and why? Books by Edward Abbey, Jim Harrison and Cormac McCarthy. The characters and the language. Not so much the scenery or landscape discriptions. Daniel Woodrell is the only writer I have ever read who accurately uses the language of southern Missouri. Having grown up and presently living in a very small town in southeast MO myself (Eminence, MO about 50 miles from where the author resides) I am thrilled to read books written in the language of my home. I highly recommend all of Daniel Woodrell's books to anyone who is interested in peering thru a window into the modernday or historic Ozark hillbilly world. I love this series so far!!! I recommend this series to anyone with a pulse. Finally book 2 is here praise Allah!! What other book might you compare The Twelve: A Novel to and why? 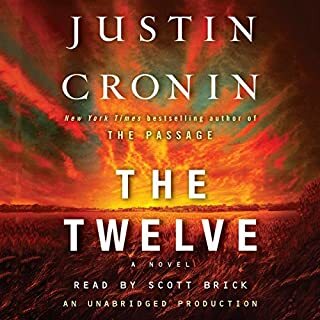 If you havn't read "The Passage" yet you HAVE TO get it as well as "The Twelve" NOOWW! Brick is one of the best narrators around and he's the perfect voice for this series. A film wouldn't be a long enough format to do this series justice. I would rather see it as a series or mini-series on hbo or showtime.